I’ve raced at the World Championships! What an awesome event. After soaking up the atmosphere in Hyde Park yesterday, walking the course, hanging out at the British Triathlon tent chatting to amazing triathletes, multiple European and World AG champions, getting a massage and having dinner at the Serpentine Bar & Kitchen with a few other first time GB athletes, I headed over to Wapping with Chris. After faffing with my race kit and different kit bags, I gave up trying to sort everything into the official check-in bag, and finally hit the sack. (Good job I didn’t have a bike to tinker with as well!) 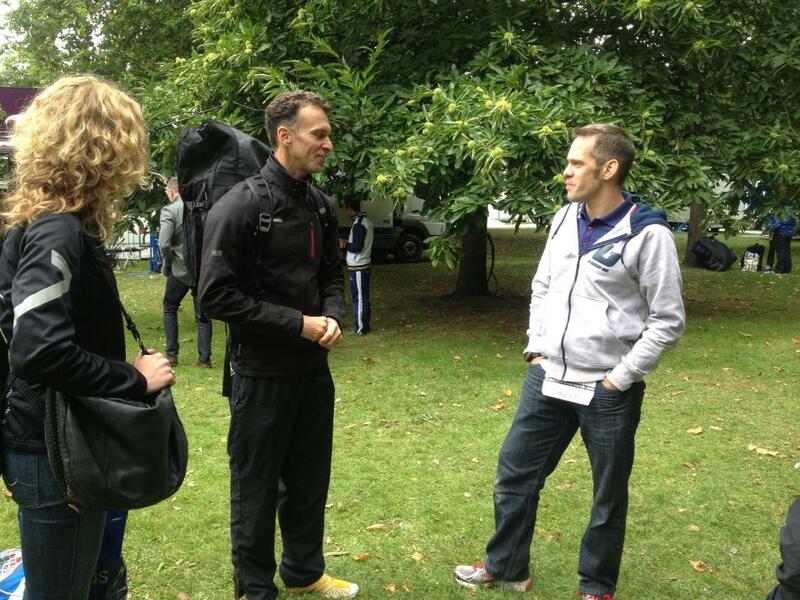 Despite a comfy bed, I woke every hour or so of course, and in the end, started my pre-race routine at 05:30. I got to the race site by 07:15, and so was one of the first to check in at transition – a good idea, as by 08:00 the queue was several hundred athletes long! 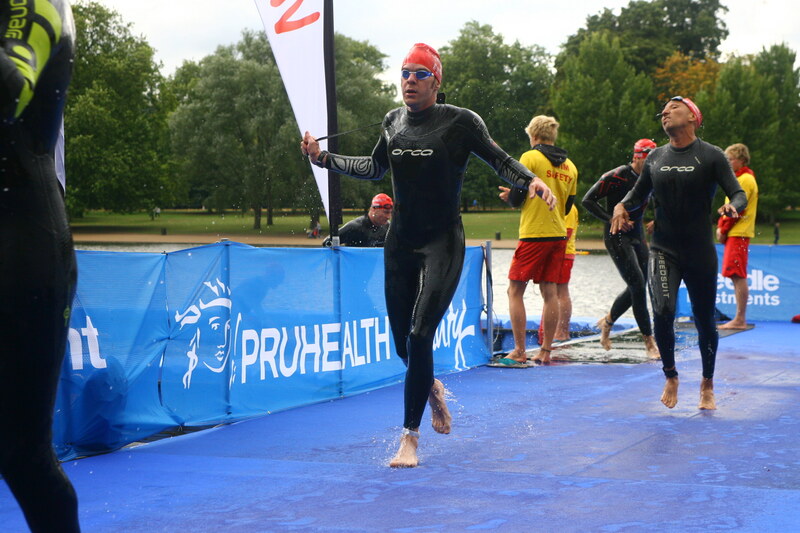 All 1000+ age group athletes for the aquathlon were ‘racked’ together at the same time on the blue carpet adjacent to the swim start/exit pontoon and the elite transition in front of the grandstand. I lucked out with a relatively simple spot to find towards the far end of transition. Since we wouldn’t be allowed int the lake before the start, I fitted in a good dry-land swim warm-up and a 10 minute jog to activate running muscles. Then my wonderful support team started to arrive. Em, Kitty and Isaac met up with Andy at Paddington and arrived at Hyde Park together. My parents and Chris arrived a bit later, and so we all went and checked my shoes were still lined up nicely in transition. I doused myself in baby oil and pulled on my wetsuit. With twenty-five minutes to go, Andy kept me company while the others went and bagged a great spot up on the grandstand. 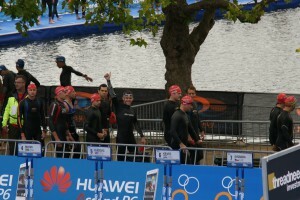 Shortly after, I was making my way with the rest of the 30-34 Male and 35-39 Male AG competitors into the swim pen. We sat on the pontoon, the seconds ticked down, and then we were in. There wasn’t much to hold on to, but I managed to get a toe on the underside of the pontoon and when the horn sounded I got a good start. There was a decent 200m or so to the first buoy, so although everybody was converging, the swim was positively genteel by comparison to Nottingham for example. The first three buoys were in quick succession and then there was a long back straight. There had been something of a sorting out by this point and I found myself going absolutely stroke-for-stroke with another swimmer. I picked it up and got up to the next group as we came through the final two ‘gates’ (yellow buoys on left shoulder, red buoys on right shoulder, had been repeated many many times in the race briefing!). My time at the mat was 15:25, perhaps thirty seconds down on where I’d hoped, but swims are very hard to compare. 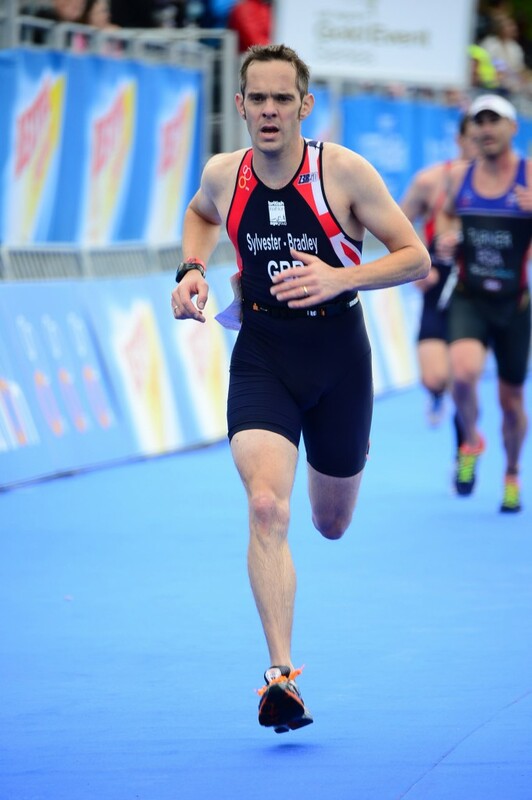 I’m sure I didn’t get my wetsuit undone as fast as Richard Stannard would have liked, but the long run to my spot meant I had it round my waist, and was smoothly out onto the run in 58 seconds, 4th fastest in my age group, very pleasing after the effort I’ve put in this year to improve! Andy even managed to get some great video while dad, Em and he yelled encouragement before dashing back up to their seats in the grandstand. The run was tough. I struggled with a mild stomach cramp all the way round, so didn’t max out aerobically. As well as the cheer from the grandstand, wearing my GB kit meant I got lots of “Go, GB!” calls from the crowds round the Serpentine. Along Rotten Row, where things were a bit quieter, a shout of “Go, Gareth!” from Julian Middlewick lifted me again on both laps. Julian would race a few days later in the Olympic distance. Steven Anyon and Jon Herd came past at about 3 km, just like at Box End, and I yelled encouragement to them and to Brits I passed. I managed a final sprint to the finish to record a 19:15 run. I’d have been pleased if my pace had been 5-10 seconds/km faster, but who cares. 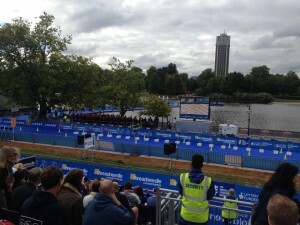 I just raced at the world champs!! The whole experience was fantastic. 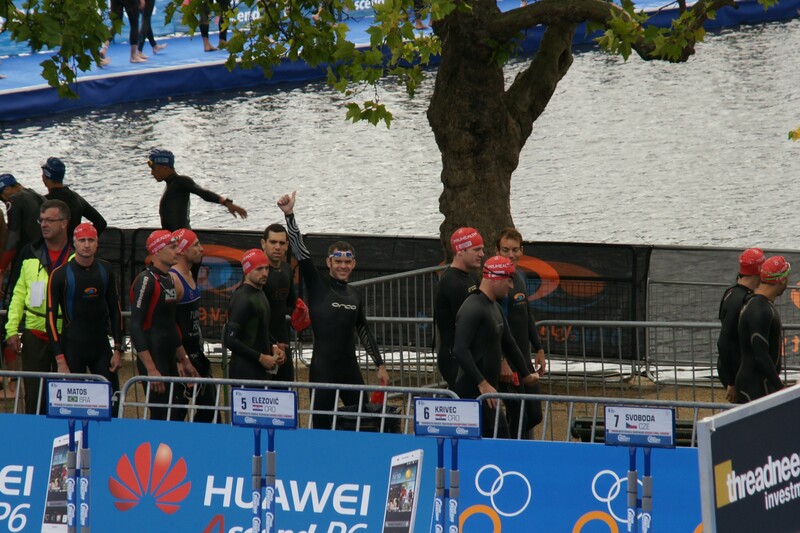 The British Triathlon organising team, including Lauren Bouchard, Peter Hallett and Ian Kitchen made the event much less daunting than it might have been, as did the camaraderie of the GB athletes. Having my family and friends present to celebrate made the day; thank you, all of you. I’m very lucky to have had Em, Kitty and Zac support me through every week on a two-year journey to this point. 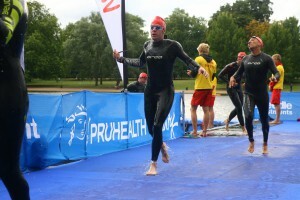 This entry was posted in Races, Run, Swim and tagged GB Age-Group Team, Race report by garethsb. Bookmark the permalink. 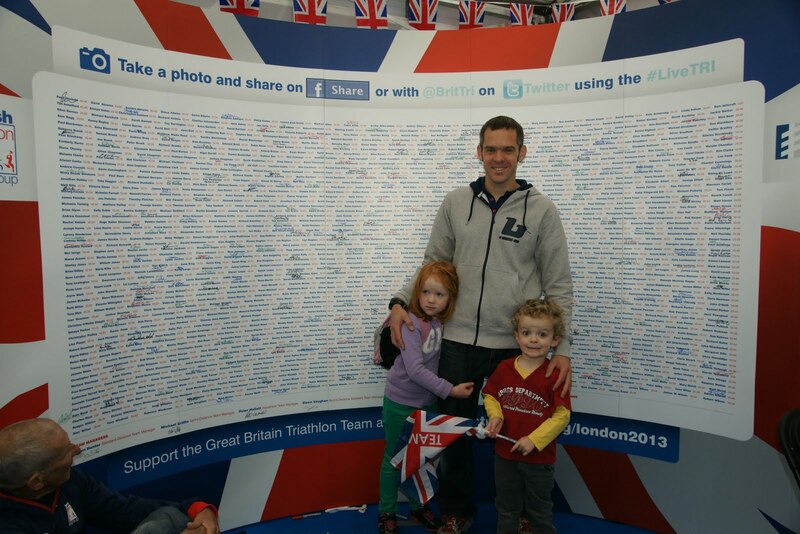 Great report G. It reflects the energy and excitement of the day, which I thoroughly enjoyed. I felt really privileged to be able to support a friend taking part in the champs and oddly enough was glad it wasn’t me in your place. Well done for keeping it all together before and on the day itself as well as a great performance. Great report Gareth, came across like a big kid describing his first sports day so could tell you were excited and sorry I wasn’t there supporting, will make more of an effort next year.